Astronaut Gordon Cooper Dies - Universe Galaxies And Stars Section. Astronaut Gordon Cooper, who piloted missions in both the Mercury and Gemini programs, died on Monday at his home in Ventura, California; he was 77. Cooper was the youngest of the original 7 Mercury astronauts, and his mission on May 15, 1963 - the final one in the Mercury program - lasted more than 34 hours and 22 orbits. Cooper and Pete Conrad flew the third flight of the Gemini program in 1965, and stayed in space for 191 hours, establishing a new space endurance record. Gordon Cooper Jr., the Astronaut who piloted the sixth and last flight of the Mercury program and later commanded Gemini 5, died earlier today at his home in Ventura, Calif. He was 77 years old. "As one of the original seven Mercury astronauts, Gordon Cooper was one of the faces of America's fledgling space program. He truly portrayed the right stuff, and he helped gain the backing and enthusiasm of the American public, so critical for the spirit of exploration. My thoughts and prayers are with Gordon's family during this difficult time," said NASA Administrator Sean O'Keefe. "Cooper's efforts and those of his fellow Mercury astronauts, Alan Shepard, Gus Grissom, John Glenn, Scott Carpenter, Wally Schirra and Deke Slayton, serve as reminders of what drives us to explore. They also remind us that to succeed any vision for exploration needs the support of the American people." "Gordo was one of the most straightforward people I have ever known. What you saw was what you got," said fellow Mercury Astronaut and former U.S. Senator John Glenn, in a statement released by the Astronaut Scholarship Foundation. Another of the "Original Seven," Wally Schirra added, "We seven were bonded like brothers, maybe even closer if that's possible." "He never said 'you can't do it.' He was gung ho on everything," said Norris Gray, the NASA Fire Chief and Emergency Preparedness Officier during the Mercury days. Sam Beddingfield, then Mechanical Engineer for Project Mercury added, "He knew what he was doing and could always make things work." "Gordon Cooper's legacy is permanently woven into the fabric of the Kennedy Space Center as a Mercury Seven astronaut," said Kennedy Space Center director Jim Kennedy. "His achievements helped build the foundation of success for human space flight that NASA and KSC have benefited from for the past four decades. "While the KSC family mourns the loss of this space pioneer, we honor his contributions and rest easy knowing his imprint on KSC will last forever. I consider it a privilege to have known Gordon Cooper. On behalf of the KSC family, I extend condolences to the Cooper family and our prayers are with them in their trying days ahead. " The youngest of the original seven astronauts, Cooper's flight in his Faith 7 capsule stretched the capabilities of the Mercury spacecraft to the limits. The mission, May 15 and 16, 1963, lasted more than 34 hours and 22 orbits. That was more than three times the longest U.S. human space flight until that time, and far exceeded the initial design capability of the capsule. During his flight, Cooper also became the first Astronaut to sleep in space. "NASA's astronauts extend their deepest sympathies to Gordon Cooper's family," said Kent Rominger, chief of the Astronaut office at NASA's Johnson Space Center in Houston. "He was among the first pioneers in space and his achievements inspired many of us to pursue our dreams of exploring our universe. We salute his many accomplishments as an Astronaut and as a husband and father. He will be truly missed." Cooper and Charles "Pete" Conrad Jr. flew the troubled and suspenseful third flight of the Gemini program in August 1965. The goal of the mission was to prove astronauts could survive in space long enough to perform a lunar mission, which takes eight days. During their eight-day mission, they experienced a number of problems with power systems, thruster fuel, venting gas that caused the spacecraft to roll, and more in a seemingly unending series. But they stayed in orbit for almost 191 hours, 122 orbits in nearly eight days, and got themselves and their spacecraft back intact. In orbit, they accomplished a "shadow rendezvous" with an imaginary spacecraft, an exercise demonstrating it could be done. The Gemini 5 mission established a new space endurance record at the time, travelling 3,312,993 miles in 190 hours and 56 minutes. Cooper also became the first man to make a second orbital flight and thus won for the United States the lead in man-hours in space by accumulating a total of 225 hours and 15 minutes. 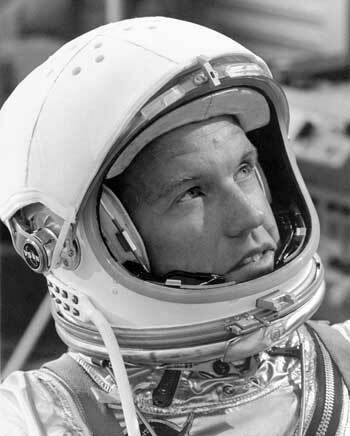 Leroy Gordon Cooper Jr. was born on March 6, 1927, in Shawnee, Okla. He served in the Marine Corps in 1945 and 1946, then attended the University of Hawaii where he was commissioned a second lieutenant in the U.S. Army. In 1949 he was called to active duty and completed pilot training in the U.S. Air Force. From 1950 to 1954 he was a fighter pilot in Germany. Cooper earned a bachelor's degree at the Air Force Institute of Technology in 1956, then completed test pilot school at Edwards Air Force Base, Calif. He served as a test pilot there until he was selected as a Mercury astronaut. In addition to his two flights, Cooper was backup command pilot of Gemini 12, launched in November 1965. He also served as backup command pilot for Apollo 10, which flew in May 1969. He left NASA and retired from the Air Force as a colonel on July 31, 1970. He founded Gordon Cooper and Associates that year and served as president of the consulting firm that specialized in activities ranging from aerospace to hotel and land development projects. Cooper was a director of a number of other organizations, most specializing in energy, advanced electronics systems, efficient homes, boats and marine systems and equipment. In 1975, he became vice president for research and development for Walter E. Disney Enterprises Inc. of Glendale, Calif., the research and development subsidiary of Walt Disney Productions. Throughout his life, Cooper pursued a wide range of activities, both professionally and as hobbies. A NASA biography lists his hobbies as treasure hunting, archaeology, racing, flying, skiing, boating, hunting and fishing. Among his numerous awards were the Air Force Legion of Merit, the Distinguished Flying Cross with cluster, NASA's Exceptional Service Medal, the Collier Trophy and the Harmon Trophy. He was the first active-duty military man to address joint sessions of Congress twice. Cooper continued to design and test new aircraft in Southern California, never giving up his passion for pushing the envelope. Cooper told a reporter when he was 71, "I get cranky if I don't fly at least three times a month."